Can you tell us something about your work, the materials you like to use, the characteristics of your style, the themes etc.? The inspiration for my current series of woodcut relief prints (Beauty & His Beasts) came from the timeless, inspired words of Scripture, which describe a number of sublime and often bizarre creatures. 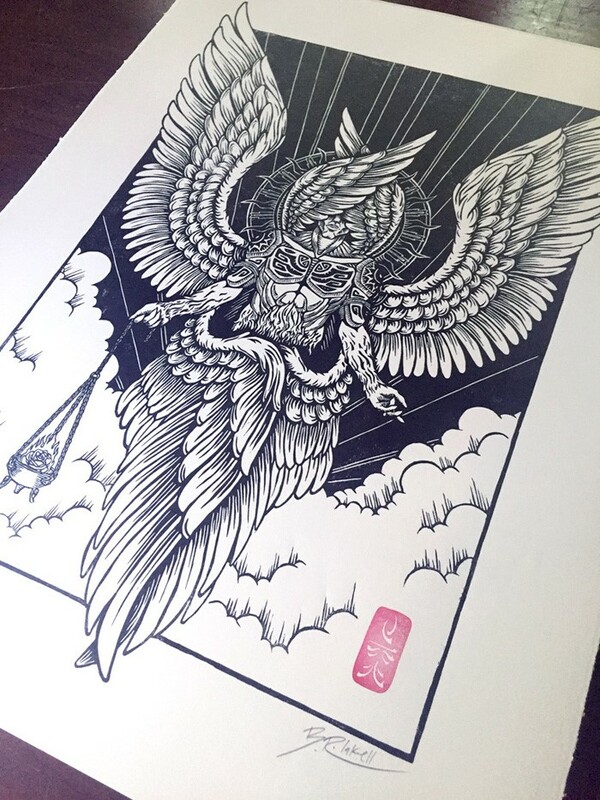 The pervading theme for this series of prints is the Fear of the Lord. These mystical creatures described in both the New and Old Testament alike are a reflection of the sublime beauty and awful majesty of God’s glory. 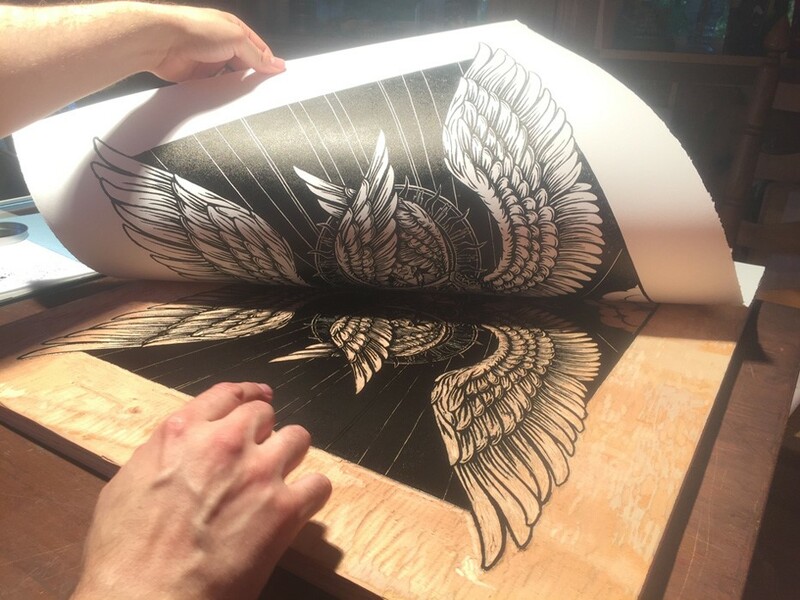 Seraphim, the first print in the series, was an iconographic interpretation of Isaiah 6, which records a majestic, yet terrifying, encounter with a six-winged creature and centers on the beauty of God’s fiery atonement. 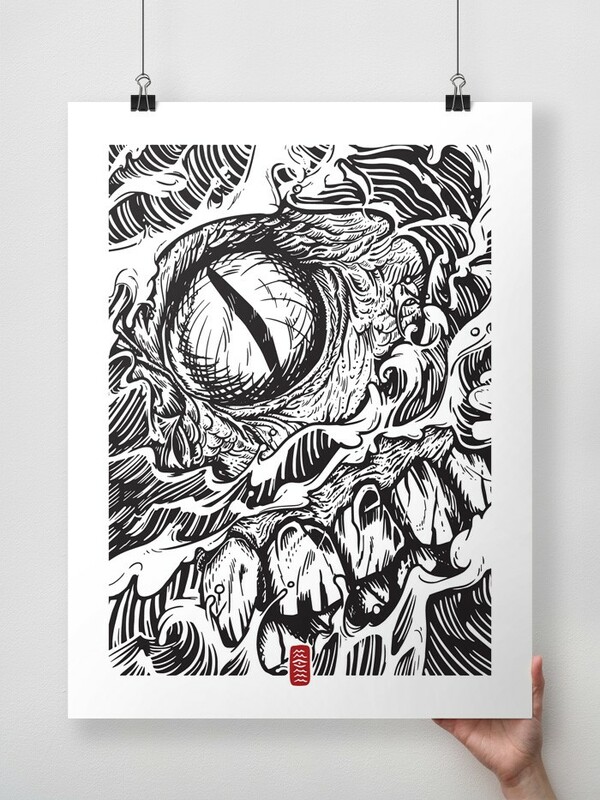 My next print in the series, Leviathan, focuses on the terrifying sea monster (as described in Job 41) subdued by God alone who governs all of creation with his exceedingly infinite power. Stylistically, the Beauty & His Beasts series of prints has been heavily influenced by Asian art and culture. After spending time studying the work of traditional Japanese woodblock artists I knew this was a direction I wanted to explore. But I also drew inspiration from contemporary artists like James Jean and Hayao Miyazaki. My goal has been to honor this rich artistic heritage without being derivative. What do you want to achieve with your work? What do you see as your challenge(s)? Visually, I want the prints in our Beauty & His Beasts series to communicate something about the sense of awe, wonder, joyful trembling, and sober reverence that we can experience in the presence of an all-holy God. When I first started doing woodcut prints of the bizarre creatures described in Scripture, I didn’t know how people would react. Surprisingly, the overall concept has been well received. It’s interesting because the woodcuts appeal to a very diverse intersection of people from bible scholars to tattoo artists. Some people appreciate the prints for their visual aesthetic, which is very bold, graphic, and mythic. Others appreciate the underlying biblical truths that inform the designs. And the challenge for me is to merge those two distinct frameworks into one beautifully bizarre, yet meaningful, piece of art. Does your view of the world or faith affect your work? How? I like to think of myself as a liturgical artist. The word “liturgy” literally means “A work of the people”. In other words, liturgy is the work that a local group of Christians do to celebrate the work that the Holy Spirit has done in them. I believe that should encompasses every aspect of our corporate worship services, but also the work we do out among our local communities. So the purpose of liturgical art is to celebrate, in a visual medium, the work of the Holy Spirit in God’s people. Liturgical art, like all liturgy, is a spiritual act of worship by the people and for the people that bears witness to the glory of God in Jesus Christ through the Holy Spirit. 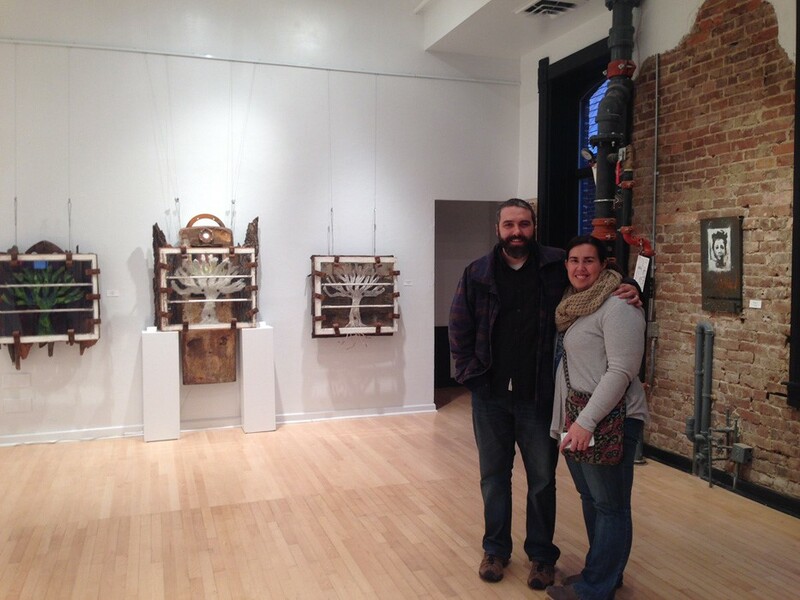 For me the process of creating art is a visual meditation on the triune God and how he relates to his people. It’s a way that I can pray using pictures. Can you tell us where to find out more about your current projects?